This is what happens when Captain Thorndike, renowned British Big Game hunter, stalks Adolf Hitler in 1938, gets him in his sights at the Führer's retreat at Berghof in the wilderness of the Bavarian Alps. A justifiable intervention in the course of History? We all know what happened when Gavrilo Princip shot and killed the Archduke Franz Ferdinand in Sarajevo, June 28, 1914. World War... and who is to say what would've happened if Hitler had been assassinated in 1938? No war? Well, we never find out as Thorndike gets stymied by a Nazi guard who's been patrolling the forest, and the next thing he knows he's being dragged into the villa for questioning by a smooth talking bilingual officer called Major Quive-Smith (George Sanders) who -- like Reichmarschall Goering -- happens to be a hunter himself and knows all about Thorndike. It just so happens that Thorndike's brother, Lord Riseborough, visited the Führer last week at Berghof to negotiate an "appeasement", so it's obvious that Thorndike's assassination attempt is connected to the British Government's strategy; all Thorndike has to do is sign a document confessing that he's an agent of the British Government, then he can leave as a free man. Thorndike protests that he was acting alone, hiked across the frontier, lived in the woods until the opportunity presented itself, all part of the "sporting stalk". 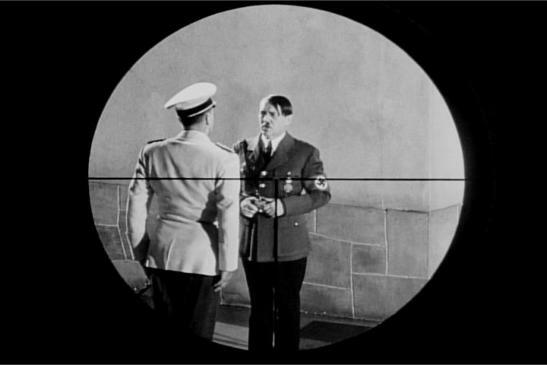 Quive-Smith doesn't believe Thorndike's cerebral explanation about aesthetic morality, the "sporting stalk", that he never intended to actually shoot Hitler (we know differently of course as we saw him reconsider), has him beat up by a couple of guards, then dragged to the cliff where he drew down on the Führer. The sequence is amusing, as Thorndike is pushed over the cliff by the "Doctor", Quive-Smith's chess partner, and the hapless hunter follows his rifle a couple of hundred feet to the bottom; the intention is that Quive-Smith and the Doctor will discover Thorndike's body the next day during a hunting party, then announce to the world the bungled assassination attempt by the British. 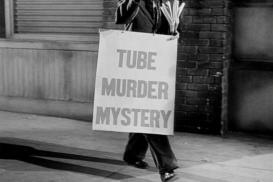 To this point Fritz Lang's film follows the source novel Rogue Male (1938) closely, and while the ending is in the spirit of novelist Geoffrey Household, the action thereafter is a clever improvisation on the original story, with Lang and scriptwriter Dudley Nichols introducing new characters while reinventing others. Instead following Thorndike's escape down river -- possibly the Rhine -- Lang cuts straight to an anonymous port where Thorndike escapes a harbour patrol by rolling over the side of his dingy and swimming through the darkness to a Danish freighter where he is sportingly hidden by a British cabin boy (Roddy McDowell). In the novel, cash is never an issue as Thorndike carries plenty (despite his passport being recovered by Quive-Smith), but in the film he's at the mercy of the kindness of strangers, who he rather easily charms. His "Class X" personality sees him through this, as people of all classes respond to him easily... even Quive-Smith, always appreciative of the hunting fraternity even when pursuing a member to the kill. "Class X" is a type that Geoffrey Household discusses at length via the monologue that propels the action in his novel. Essentially it refers to a classless type who, regardless of birth and education, has an innate humanity, can relate to anyone without subservience or bullying. Vaguely religious, or socialist, or even Libertarian, the notion falls somewhere between Madame Blavatsky and Jeremy Bentham. It's an inter-war idealism, a pre-New Age cultural skin shedding that many writers of the period expressed, most notably James Hilton in Shangri-La (1933) or Somerset Maugham in The Razor's Edge (1944). Its technocratic expression can be seen in H.G. Wells' clairvoyant novel The Shape of Things to Come (1933) (the movie version, released in 1936, directed by William Cameron Menzies, if not directly influenced by Fritz Lang's Metropolis (1927), is certainly in sympathy with it); there's no real discussion of Class X in Man Hunt, although the spirit of it is forcefully expressed in Walter Pidgeon's charismatic portrayal of the hero, and when a smitten Jenny Stokes (Joan Bennett) calls him a "real gent", that is, a true gentleman rather than one who carries the title. The character of Jenny Stokes, the working class seamstress who gives Thorndike refuge in her flat from his Nazi pursuers in the foggy night streets of the London dock zone is an interesting departure from Household's novel. While she falls in love with him, Thorndike's attitude is more paternalistic than anything, his Class X consciousness avoiding easy sexual exploitation. Thus love becomes symbolism; in a local pawnshop, he buys her a silver (chromium) arrow brooch which she wears proudly until her eventual murder by Quive-Smith and his Nazi gang. 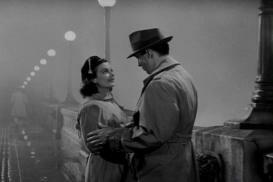 The arrow is a good inclusion by the scriptwriter as it works well in the visual medium of cinema, and is a catalytic aspect of the ending. This isn't the only clever departure from the novel, i.e. Quive-Smith, who obtains Thorndike's papers from the harbour police -- abandoned with his jacket in the dingy -- assumes Thorndike's identity and enters England as his doppelgänger, which introduces another level of symbolism into the action. And the character of "Black Hat" in the novel becomes "Umbrella Man" in the film... and while his role remains the same, his weapon becomes an umbrella sword instead of a pistol, so that his visual persona fits perfectly with that of the bowler-hatted civil servant or London bank employee. The sword also functions ironically as foreshadowing for the ending, and gives the rumble in the underground railway tunnel a certain personal edge... for Umbrella Man to kill Thorndike, he must get in close and personal. Other than the opening, this sequence is probably the best visual action in the film, although Lang's trademark light and shadow expressionism is certainly put to good use in the dock area scenes. 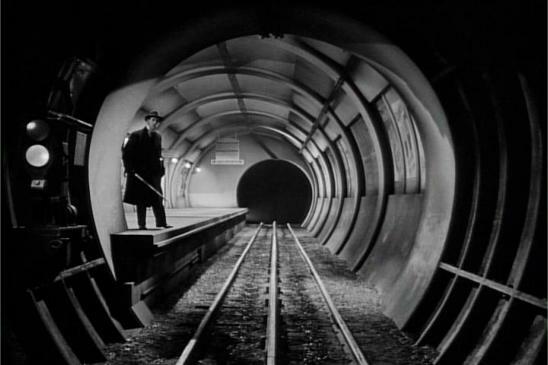 In the novel Rogue Male, Black Hat/Umbrella Man is ambushed by Thorndike in the shadows of the tunnel; they struggle for Black Hat's pistol and after a punch to 'the solar plexus' Black Hat collapses onto the centre rail and gets electrocuted... and thereafter Thorndike is a fugitive not only from Quive-Smith but also Scotland Yard. 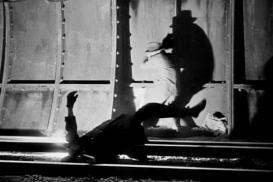 In the film, the struggle is a protracted dramatic interplay of shadows and glimpses, culminating in the sizzle and flash as Umbrella Man gets fried. Thorndike eventually goes to ground in Dorset, a coastal county south of London. He goes equipped as a survivalist, like something between George Orwell in Down and Out in Paris and London (1933) where he hits the byways as a tramp, writes it all down... and Sylvester Stallone as Rambo who, when the going gets tough, always goes primal with a bow and arrow. The ending remains faithful to the novel, with tweaks to fit the earlier deviations and additions. The novel develops Thorndike's refuge as clear sexual symbolism; Lang's film favours the primal. For the times, the action is extremely eccentric, almost a satire of human behavior typical of the anthropomorphism of British children's books like, say, The Wind in the Willows. The film has a coda which many will recognize as propaganda for the times. 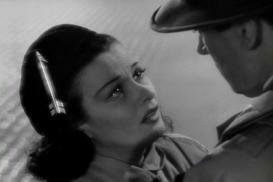 Lang shot the film in three months, early in 1941 when there was an urgency to galvanize the American public behind the war effort. Lang was still trying to establish himself in Hollywood, having fled Berlin and the UFA studios (despite Goering offering him the top job) via Paris in 1936. It's a measure of his talent as a director that this final montage actually enhances the narrative rather than just being a crude commercial for patriotism. Both the novel and film probably owe something to The Most Dangerous Game (RKO, 1932) where a castaway on an island off Brazil is hunted for sport by a sadistic mongrel Russian aristocrat, 'General' Zaroff. In the 1945 Robert Wise remake A Game of Death Zaroff becomes Erich Kreiger, a Nazi big game hunter.